Last week I finished a pair of socks for my 8-year-old stepdaughter, and although I wanted to blog about it, I ran into a little problem. 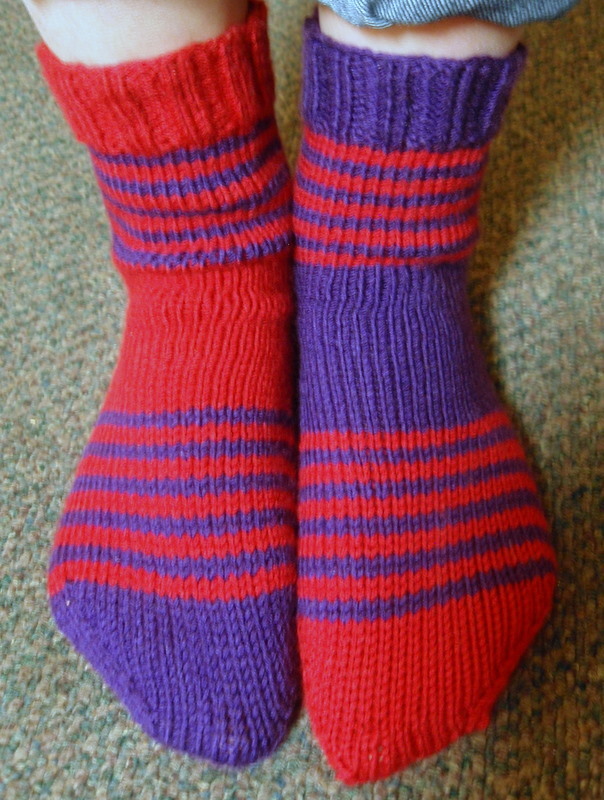 These socks – which I call Sophia’s Rugby Socks because of the stripes – are impossible to photograph, at least with my dinky camera. 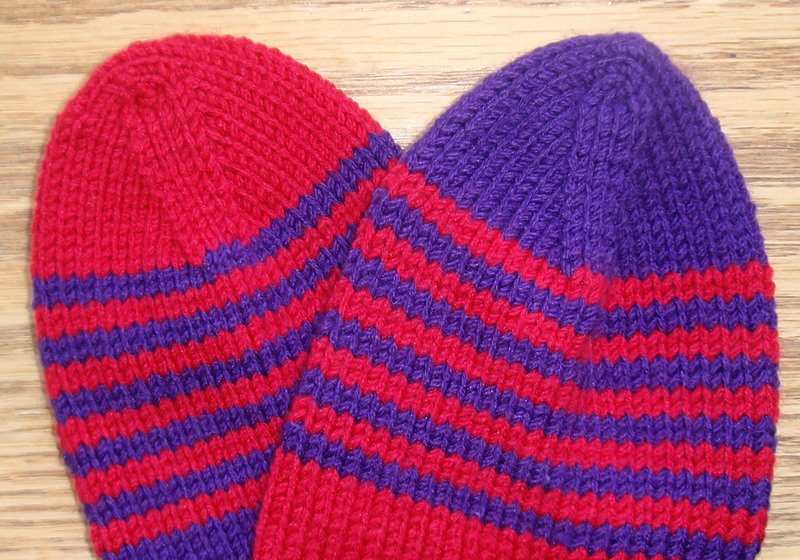 They are bright raspberry pink and royal purple in color, and although my eye can process this vibrant pairing, nearly every photo I took of the socks is an absolute mess. One of these photos is taken in natural light, and the other with artificial night in the evening. They both totally blew out the sensor of my camera. You’ll just have to take my word for it on the color. It actually looks pretty cool, and Sophia really likes them. One other thing you might notice about these socks is that they don’t match. This is because if I’ve learned one thing about my stepdaughter it’s that she doesn’t like to wear matching socks. It’s a constant battle to get her to keep her socks in pairs, and then follow through with actually wearing them as pairs. I’ve decided to temporarily roll with this quirk and rather than make her a matching pair of socks, she has a new pair that is coordinating. She really brightened up when she saw that they socks don’t match, so I think I made the right call. 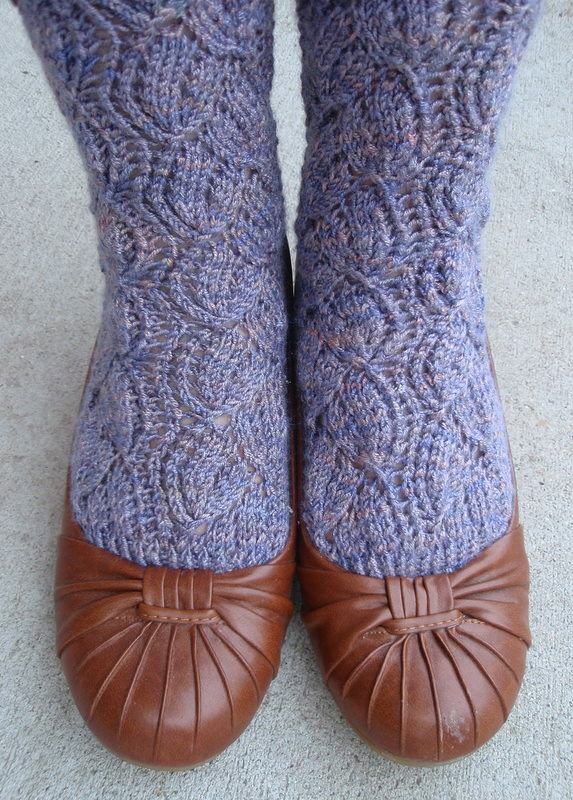 These are knit with a DK-weight yarn (nice and thick for kid activities) and feature short-row heels. This is the first time I’ve used short-row heels (not pictured, unfortunately) but I think in the future I will spread them out across more of the stitches. The heels seem a bit short compared to my usual flap heel, and I only knit across 50% of the stitches. I’ve read online that 60% of the stitches can be knit for a short-row heel, which seems like it would work much better. Pattern: I made it up as I went! 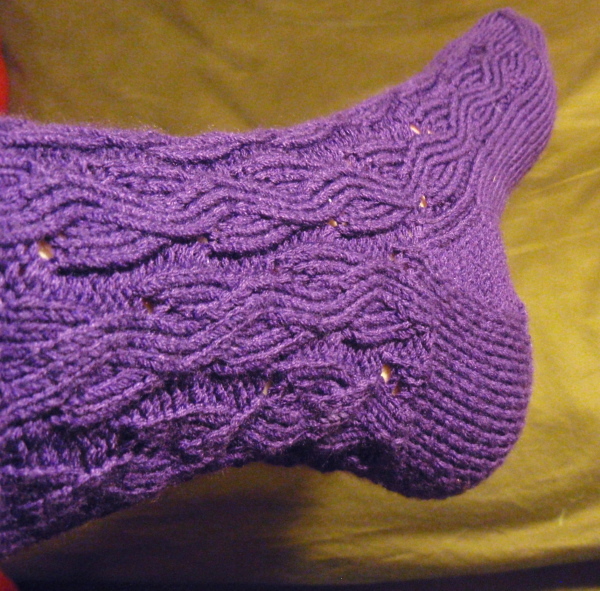 I have completed my Scent of Lavender socks – and holidays still count as the weekend, so I made my deadline. Now I just have to wait for the weather to warm up so I can show them off. They fit perfectly with my favorite wedges, so I foresee a lot of skirt days this spring. I really enjoyed this pattern, though I did make a modification by removing the ribbing on the bottom of the heel and toe. The ridges left by ribbing can be very uncomfortable to stand on, so I switched to regular, soft stockinette stitch for those sections. I had just enough yarn from the ball my brother-in-law got me for Christmas, with a little bit leftover to go into my hexipuff stash. These beauties aren't meant to be hidden in full shoes. This heel uses the Eye of the Partridge technique, a bit more feminine, but just as sturdy as the standard flap heel. I have been, over the years, an unsuccessful blogger. I don’t even know how many blogs I’ve started with the same zeal I begin a new gym routine that will be sure to get my into bikini shape within weeks, only to fall out of posting and caring, along with skipping the gym. However, this time I think I might make it work. Though I am a knitter of limited resources and can’t buy all the thick, soft sweater yarn or even afford to make scarves very often, a single skein of sock yarn is often within my budget. I was pleasantly surprised to discover that – along with some good beer and encouragement from the Yarn Harlot (Stephanie Pearl-McPhee), knitting socks isn’t that hard. Not only is it not very hard, but it’s addictive and rather exciting. Turning a heel seems like a giant accomplishment, though after waving my sock around for awhile explaining to my husband that he should be very impressed, I began to feel more humble about the act. After all, I did use a pattern. The pattern was chosen after the yarn, and the color after the pattern, which worked out better than could have been expected. I love lace and had access to Berroco Comfort DK (DK/Sport) at my favorite local yarn shop, Loopy Knit/Crochet. 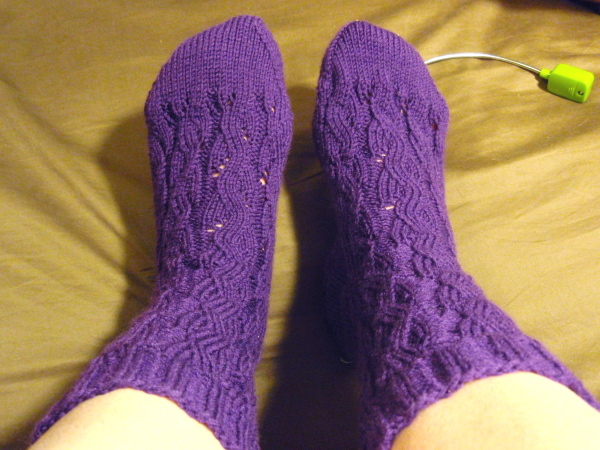 After searching Ravelry for appropriate – and free – patterns, I decided a nice purple would work well with the natural, water-type theme of the socks and my mom’s personality. The socks are River Rapids by Sockbug. My Barnes and Noble Nook stores pattern PDFs wonderfully and paper is so 20th Century. Magic Loop may not be as elegant as DPNs, but is extremely easy to learn with the help of some YouTube videos and turning a heel on two needles beats the hell out of three or four. Turning a heel is exciting and gratifying. Grafting a toe with kitchener stitch is about the only thing more exciting and gratifying than turning a heel. It is possible to love an acrylic/nylon yarn. It’s so possible to love than yarn, that you buy more to make yourself a pair of socks next.